Deliciously aromatic and full of flavour! The beautiful blue rice just brims with fragrance, while authentic side dishes elevates the whole platter. 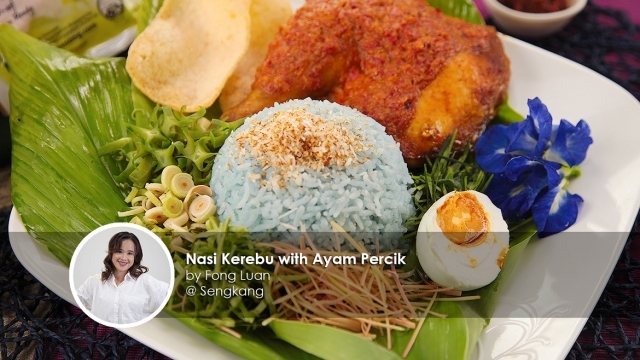 This Nasi Kerabu with Ayam Percik recipe is shared by home cook Fong Luan. 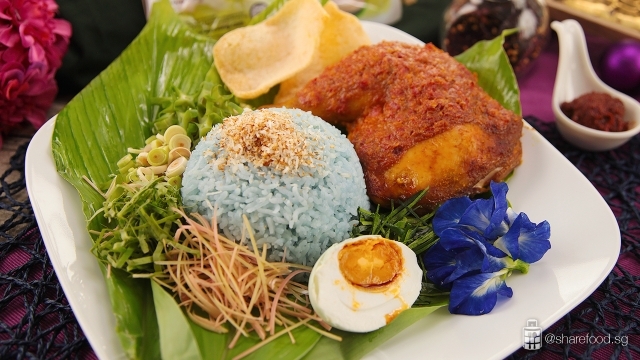 A feast for the eyes and the tummy - Nasi Kerabu with Ayam Percik! 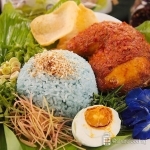 Nasi Kerabu a traditional Kelantanese dish that is visually captivating and packed with flavours. The striking blue colour of the rice is extracted from butterfly pea flowers and the fragrance comes from the rich herbs it is cooked with. 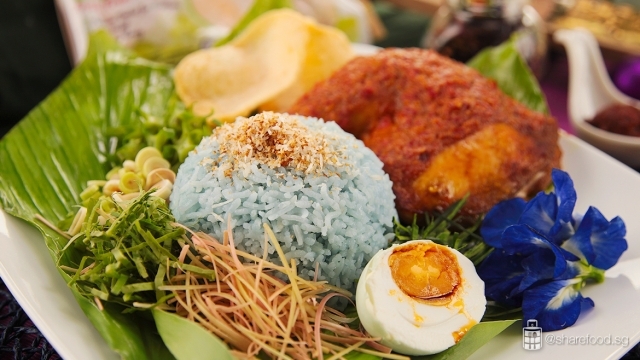 In this Nasi Kerabu with Ayam Percik recipe, we plate the rice with prawn crackers, solok lada, salted egg, ulam, grated coconut and Ayam Percik, well just to name a few. 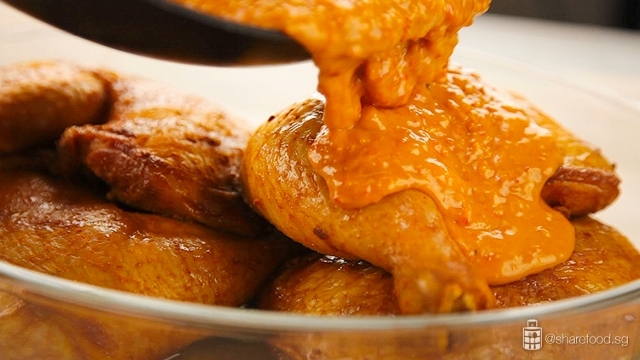 The secret to making tasty and tender Ayam Percik is the cooking method. In this recipe, we're using Kee Song fresh whole chicken leg as it is deliciously tender when cooked with any cooking method. Firstly, we marinate the chicken and leave it aside to absorb in the flavours. Next, we bake it and this helps to make the meat tender. Lastly, we then coat the chicken evenly with chilli gravy and grill it in the oven. This step allows the sauce to absorb into the chicken and makes it really delicious! Pour the chilli gravy over the baked chicken leg and coat it evenly. Dish your plate with a mound of rice, fresh herbs, vegetables, delicious Ayam Percik, salted egg, grated coconut and a dollop of sambal belacan! Don't just stare and adore this kaleidoscope platter, make this Kelantan speciality for your family and they will be hooked! Serve this traditional Kelantanese dish with a dollop of sambal belacan on the side! 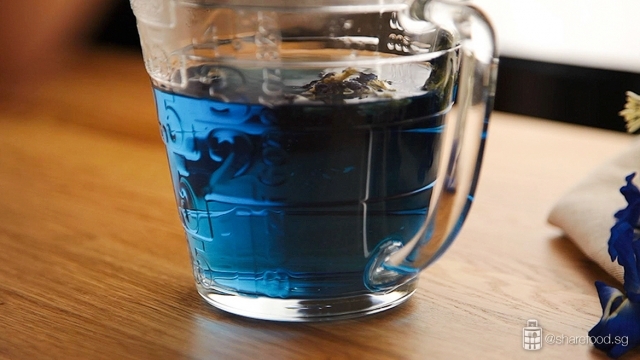 Soak blue pea flowers in 2 ½ cups hot water. Remove blue pea flowers from the water and pour into the rinsed rice. Soak for 10 mins. Add in kaffir lime leaves, galangal and lemongrass. Cook the rice as per normal. Place the chicken legs in a mixing bowl. In a small bowl, mix ingredients (A). Pour it over the chicken leg, rub it evenly. Cover and transfer to the chiller, marinate for at least 1 hour. Preheat the oven to 180 degree Celsius for 20 mins. 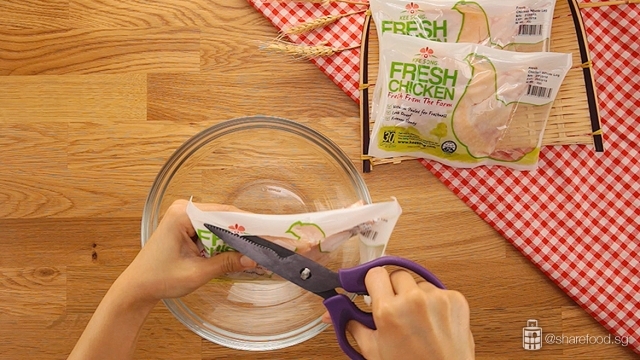 Remove the chicken from the fridge and let it sit in room temperature till the oven is ready. Transfer the chicken into the oven and bake it for 20 mins. Once it is cooked through, set aside. In a blender, add in ingredient [B]. Blend till smooth. In a wok, add in chilli paste and fry for 5 – 10 mins till fragrance. Add in tamarind juice, coconut milk and chicken stock. Bring it to boil and reduce to medium heat. Simmer for 10 – 15 mins. Add in salt, sugar and cornflour mixture. Switch off the fire. Pour the chilli gravy over the baked chicken leg, coat it evenly. Transfer the chicken leg into the oven. Use top heat and grill at 200 degree Celsius for 15 mins. If you like it more char, you may grill it longer. In a serving plate, surround the rice with Ayam Percik, fresh herbs/vegetables and other side dishes.